Smoky Mountain Cabin Rentals Next to Dollywood. The Destination for Family Vacations, Family Reunions, Retreats, Large Groups and Gatherings, Premier Luxury Smoky Mountain Cabins & Cabin Rentals. 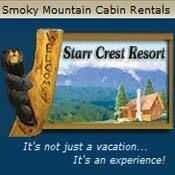 Starr Crest Resort Smoky Mountain cabin vacation rentals, nestled in the heart of the Great Smoky Mountains of Tennessee, overlooking Dollywood Theme Park and Pigeon Forge, one of the fastest growing tourist cities in the South, and only minutes from Gatlinburg. The Pigeon Forge - Gatlinburg area resort features luxury Smoky Mountain log cabins in a spectacular mountain setting, onsite swimming pool, childrens playground, city water, and wide paved roads. Our Smoky Mountain cabin resort entrance is located only 1.2 miles from the main entrance of the Smoky Mountain Dollywood Theme Park. Our property borders the Pigeon Forge city limits and is only 6 miles from Ober Gatlinburg and The Great Smoky Mountain National Park. All of our Pigeon Forge cabin rentals have spectacular views, game rooms with pool tables, hot tubs, jacuzzis, fireplaces and more. We welcome you to take a look at all our Smoky Mountain cabin rentals, mountain resort amenities, Smoky Mountain Vacation Package Specials and cabin rental specials. Enjoy your family vacation, honeymoon, anniversary, romantic getaway or family reunion in our luxurious, premier over-night cabin rental resort! Brand new this summer we have added a playground for the kids.